March on Super Bowl challenges police brutality and racism | Fight Back! 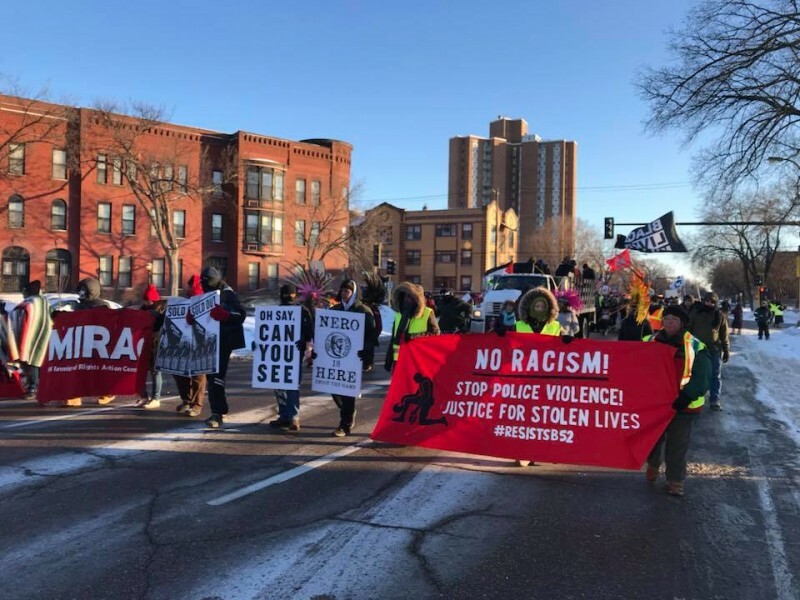 Minneapolis, MN – Braving sub-zero temperatures, more than 500 people protesting police brutality, racism and corporate greed gathered in south Minneapolis at Peavey Park and marched U.S. Bank Stadium, the site of the Super Bowl, Feb. 4. Upon arriving at the stadium, hundreds of participants took a knee to show their opposition to racist police terror. Loretta Van Pelt, of the Twin Cities Coalition for Justice 4 Jamar and Super Bowl Anti-Racist Anti-Corporation Coalition (SAAC) welcomed protest participants and underscored the need to resist the epidemic of police violence. SAAC is made up of over 20 organizations fighting against police brutality and defending immigrant rights, indigenous rights, women rights, labor unions and students. The organizations include: AFSCME 2822; AFSCME 3800; American Indian Movement; Anti-War Committee; Asamblea de Derechos Civiles; Black Lives Matter - MN; Black Lives Matter - Twin Cities; Black Saint Paul; Blue Lies Matter; Communities United Against Police Brutality; Filipinx for Immigrant rights and Racial justice in Minnesota; Freedom Road Socialist Organization - Twin Cities; Minnesota Immigrant Rights Action Committee; MN Neighbors for Justice; Women's March Minnesota; Native Lives Matter; The New North; Rise Up Times; Students for a Democratic Society at the UMN; Showing Up for Racial Justice MN; Take A Knee Nation; Twin Cities Coalition for Justice 4 Jamar; Welfare Rights Committee, and Women Against Military Madness.